Selamat mencoba di rumah ataupun di sekolah. It took awhile to create some new printables. My son loves playing with number rods lately so I make some for him and of course you can download them too. Here are the number rods variation cards. 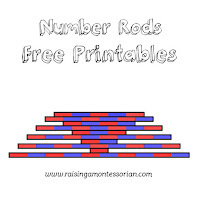 Click on the picture to download number rods printables. I would like to see you post on instagram when you are using these cards, don't forget to tag me. Thank you. Tujuan dan presentasi tongkat angka (number rods) dapat dibaca di sini. Tongkat angka juga dapat digunakan untuk stimulasi sensorial. kita bisa memberikan variasi kegiatan tongkat angka dengan kartu kontrol (control card). Klik gambar di atas untuk mengunduh kartunya. After juggling to take photos and editing some knobless cylinders variation, here are some control cards for you. Enjoy! Please tag my instagram @raisingamontessorian when you are using these control cards. I would be glad to see your activity. Click on the picture to download pink tower variation. *Please, do not shrink the file when printed because it will change the size of the pictures. *these printable files are for personal/classroom used only, not to be sold. **please do not share this file in any sharing site. ***refer to this address if anyone asks for the printables.